This is the first part of a series that we are publishing, dedicated to helping people find the true value of their treasured possessions. Our aim is to give you the information needed to help you figure out if you can value your own jewelry, or if you should submit it for a professional valuation. Many people may have inherited a piece of jewelry from a loved relative, or perhaps have a wedding/engagement ring that is no longer needed… whatever the case may be, here are a few tips from our specialists on finding the value. Before we begin, an important note on valuing jewelry is making sure expectations are set beforehand. Many people think they can recuperate the retail value of their jewelry. However, the value of fine jewelry depreciates as soon as it’s sold. A piece of jewelry is like a car; it can lose approximately 40% of it’s value as soon as it is “driven off the lot”. Of course, this can differ greatly depending on the type of jewelry, and several important factors to keep in mind when trying to determine if your piece of jewelry is of value. Hallmarks are typically used to describe the metal content of a piece. If there is more than one hallmark, it is usually used to call out either the designer, country of origin, or manufacturer. Unless your item is over 100 years old, or the hallmark has worn off, all fine jewelry should have some type of visible hallmark. If your item looks antique, get it professionally valued. If it looks new without hallmarks, it is most likely costume jewelry. High quality costume jewelry can be confused with fine jewelry. However one solid indicator of whether your jewelry is of value or not, are the prongs or other attachments. 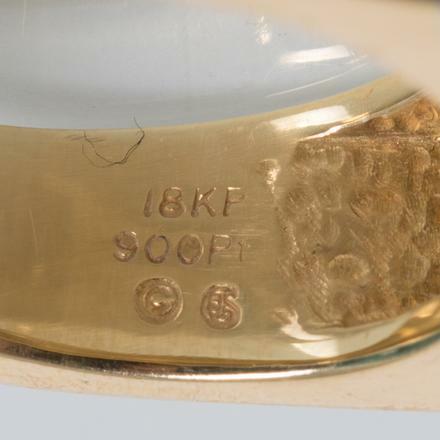 If you see any indicator that glue was used to mount the item together, this is one of the strongest indicators that your jewelry does not have value at auction. Another good rule of thumb is to hold your gold up to a magnet. If it sticks, it’s fake! If you’ve gone through this list and it appears that you may have a piece of jewelry that is of value, send it over to us for a free valuation. We’ll have our specialists take a look at it and provide you with an honest, auction value estimate.